Last Wednesday, our 24" iMac crapped out. Purchased waaaay back in mid-August of 2009, the thing wouldn't stay on for more than about ten seconds of "grey screen". A little spinning wheel, a whole lot of nothin' else. Frustrated with the unexpected glitch, I brought it down to the Carlsbad Apple Store where I was told I'd have to leave it until the next day. They cracked it open on Thursday and ordered up a new power supply and logic board (from what I've read online, a $900 part). Friday came and went with no word on the machine. Apple finally called last night with the cliched "I have bad news and I have good news" spiel. Bad news? Permanent hardware failure. They installed the power supply and two different logic boards and still no go. Good news? 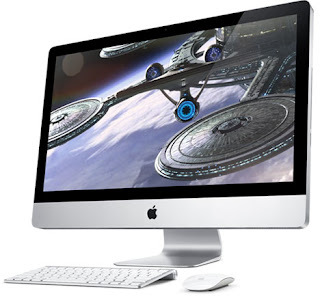 They'd be replacing our ~75 day-old computer - and not with a "refurbished" 24" iMac, but with one of the new 27" iMacs at no additional charge to us. 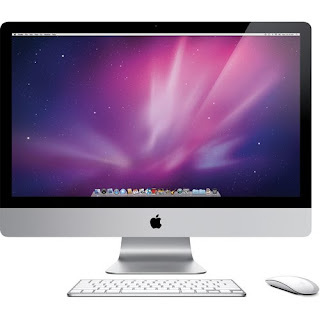 Larger, brighter and with a higher-resolution LCD screen, faster processor, larger hard drive and new wireless Magic Mouse and wireless keyboard. SD slot, full aluminum construction, lower energy use. $200 more at retail. How could I say no? Especially since they were also able to transfer all of my data from the original iMac. No set-up required, no formatting, etc. Plug 'er in and everything is familiar. This thing is a monster, and I say that in a good way. The old machine was way more computer than I needed but I loved working on it. Now I'm looking forward to playing around with this to see what she can do. I am already loving the Magic Mouse and the lack of clutter from the lack of wires.